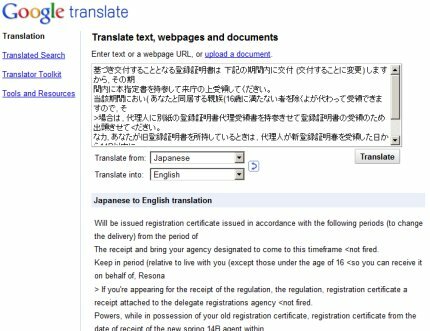 If you have a Japanese document on paper there are plenty of services that will translate it for a price, but it is also possible to get a machine translation done for free. It might not give you a great translation, but it might be good enough for you to at least work out what the document is. There are two stages to translating a document in Japanese. Converting an image (i.e. a scan of the document) into Japanese computer text. Translating that Japanese text into English. The WeOCR Project will allow you to convert your scan into Japanese text (Kanji, Hiragana and Katakana). A high quality scan will work best, but I’ve had ok results as well with an image taken using a digital camera. Go to their Japanese character recognition page to get your scanned image converted into Japanese text. Then copy the text (highlight it and then Ctrl-C on Windows), and paste it (Ctrl-V) into Google’s Japanese to English translator. And you have now done your free Japanese OCR translation! 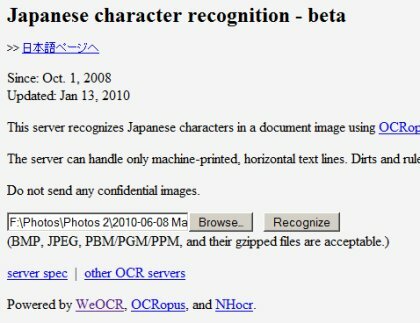 As you have the raw Japanese text (from the OCR step) it it possible for you to manually fix any OCR errors if the text is important enough for you to spend the time doing so. If any of the kana are wrong you can simple copy the correct ones over using Wikipedia’s Hiragana table, or their Katakana table. If you install the Japanese IME you’ll easily be able to type in the kana characters, and if you enable the IME pad (choose the Japanese keyboard, right click the icon with the red circle, and click ‘Additional icons in the taskbar’), you’ll be able to have a go at drawing the kana or Kanji – if you are close enough it should recognise the symbol. If you don’t find the Kanji drawing recognition is working, you can use an online tool to select the correct Kanji by clicking on which radicals you see in it. Denshi Jisho works for me, or if you have an iPhone, the latest version of Kotoba has Kanji radical search built in. You’ll need to know a bit about how Kanji are constructed to use these tools. Once you’ve figured it out you can look up the Kanji relatively quickly. When you’ve corrected the Japanese text, you can feed it back into Google Translate and hopefully you’ll get a better translation than before. This entry was posted on Tuesday, June 8th, 2010 at 11:34 pm and is filed under Computing, Japan. You can follow any responses to this entry through the RSS 2.0 feed. You can leave a response, or trackback from your own site. Thanks a lot, it was really helpfull! Very helpful. Have been searching for some time on how to input Japanese characters on a qwerty keyboard and how to get the text from an image. Your explanation is just what I was looking for. THANKS. Do you know any OCR software online or relatively cheap to convert Japanese vertical image text? Hi o, I’m not familiar with OCR software that can convert Japanese vertical image text – but it must exist in Japan! The Japanese for ‘Japanese OCR software’ is 日本語OCRソフト if you want to search for it.